No, we aren't a wedding party. 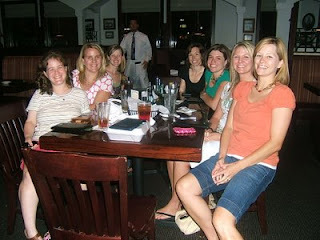 Nope, none of us are related. No, really, we're not celebrating anything in particular. 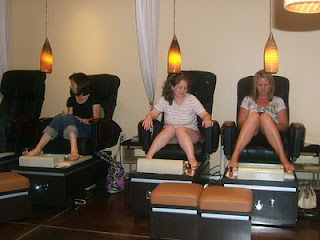 We're just a bunch of mommies who needed a little "me" time. "Me" time, and some carbs at a yummy Italian restaurant. You know, the kind of restaurant where someone else brings food to the table, carries away the dishes, and doesn't call you Mommy. 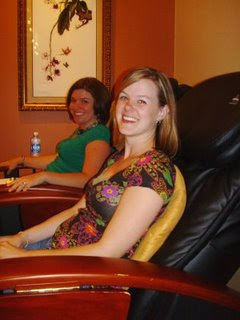 The pedicurist could have been a little more chipper, and I certainly could have eaten less, but the company was superb and I can't wait to do it again! How does Saturday morning sound? I'm jealous! Looks like you had a great time, Mon! I can't wait to get down there & see you! Sounds like fun! I'm so glad you did that! Cute toes!! And I am so glad to see that you got your carbs, and to see a smile on that beautiful face of yours!! Yummy, I love Carraba's! 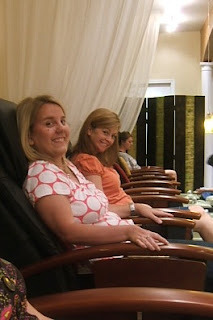 Glad you got some girl time in and your toes look great! Looks like you had fun! So glad you were able to do something "just because". Money back in my pocket. Sorta. Father's Day is THIS Sunday! Is it just me, or is this in poor taste? Anybody else wanna fess up?